This small and stylish Aqua Fountain by Petsafe Aqua Cube drinking fountain is a wonderful solution to encourage small dogs and cats to drink more. The drinking fountain offers a solution to overcome some of the iΒues that can put pets off drinking by keeping the water fresh and using filters to prevent odours and the spread of bacteria. It has a quiet pump that keeps the water circulating in a continuous waterfall, mixing oxygen into the water as it falls. The water flows down a little ramp, like a water slide, which stops the water from spraying and keeps splashing noises to a minimum. It is then taken through a foam filter that catches hair and other impurities to prevent the pump from becoming blocked. In addition, an active carbon filter absorbs bacteria and keeps the water smelling fresh. The Aqua Cube has a 1.2l capacity and is dishwasher safe (apart from the filter and pump). Aqua Cube Aqua Fountain by PetSafe at a glance: Waterfall drinking fountain with filters Size suitable for cats and small dogs Keeps drinking water clean and oxygenated Continuously circulating water and a waterfall: adds oxygen to the water for lasting freshneΒ Replaceable active carbon filter: gets rid of unpleasant smells and keeps the water fresh for longer Coarse foam filter: keeps the water clear of hairs and other impurities. Can be cleaned under running water Quiet water pump with low power consumption (2 Watt): barely audible pump that is economical to run Water flows down an inclined water slide: stops water from spraying and keeps splashing sounds to a minimum Dishwasher safe: All parts of the water fountain are dishwasher safe, apart from the pump and filters Colour: white Material: Fountain casing: BPA-free plastic Cable length (with adapter cable): approx. 1.7m Adapter: Power Input: 220V - 50 Hz 50mA / Power Output: 12 V - 200mA Includes user manual and instructions for use Volume: approx 1.2 litres Dimensions: approx. 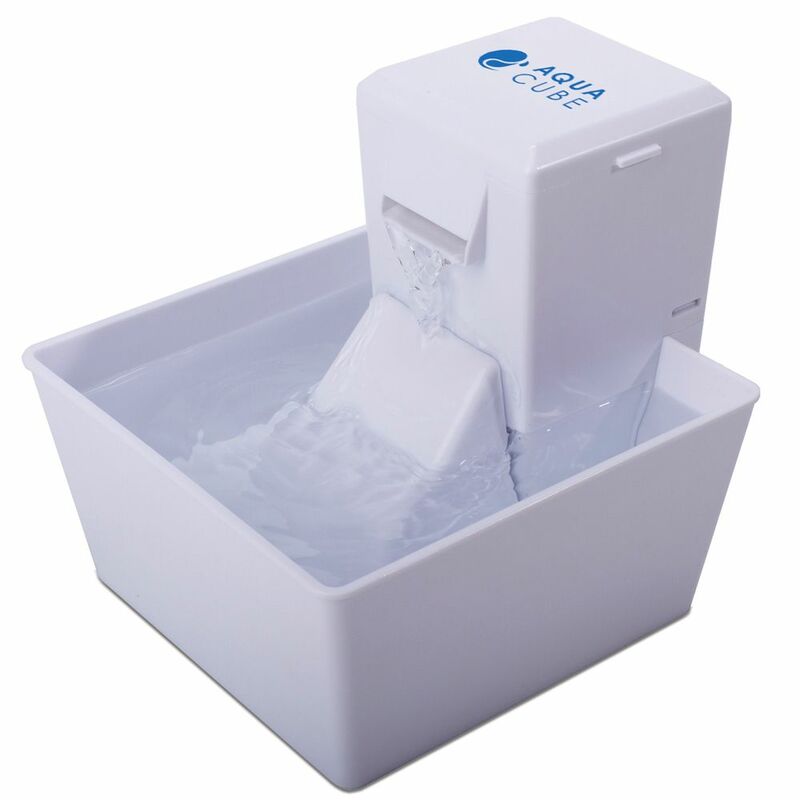 17 x 15.5 x 15 cm (L x W x H) Important note for pet fountain use: Drinking fountains need to be cleaned regularly as hair and limescale build-up can make them leΒ effective. To remove limescale, place the pump components in a mix of water and standard limescale removing product for around 2 hours and then rinse thoroughly. The pump needs to be descaled every 2-4 weeks, depending on the hardneΒ of the water in your area. The warranty is voided if you allow limescale to build up on the pump. You should also ensure that there is always the right amount of water in the water fountain and that the pump is never allowed to run dry. When run dry, the warranty is voided. Inspect the active carbon filter every 2-4 weeks. If your pet uses the water fountain, the filter should be changed every 30 days (depending on the frequency of use). If multiple animals use the same water fountain, you should change the filter more often.